Colorado is renowned for having some of the most inspiring and majestic landscapes in the continental United States. It is no wonder that people who live in Colorado refer to it as ColoRADo – there are so many “RAD” national parks, forests, mountains, ski slopes, and secret spots. With its diverse landscape, the state of Colorado is complete with snow-capped mountains, lush evergreen forests, spanning plains, desert, and river canyons. There is no shortage of options if you area looking for a hike – there is over 11.3 million acres of public land in Colorado, owned by the United States Forest Service alone, including the Uncompahgre, San Juan, and Rio Grande National Forests in the southwest corner of the state; the Pike, San Isabel and Gunnison National Forests in the center of the state; the Grand Mesa National Forest in the west; and the Medicine Bow-Routt, White River, Arapaho, and Roosevelt National Forests in the north. So where should you go if you are considering a hike in Colorado? Well, depending on the length of your trip and time of year, there are a few choices. The landscape in Colorado could be daunting, especially for beginner hikers and visitors to the state. An “easy hike” in Colorado, however, may still be a moderate hike for some people. Here are some hikes that are good for beginners, all across the state. Gem Lake is a 3.1 mile hike located near Glen Haven, Colorado in the Rocky Mountain National Park. The trail is “out and back,” meaning you must turn around in order to complete the 3.1 mile trek. The trail leads to a scenic view point about 1.8 miles into the trip. The Garden of the Gods is one of the best Colorado Springs hiking trails. It is a public park, and has been an official national landmark for nearly 50 years! The park is well-known for a variety of beautiful, unique hikes. The most accessible hike is the 3.7 mile loop that essentially leads around the majority of the park. Do not be fooled by its accessibility, however – this hike is also arguably the most beautiful part of the Garden of the Gods Park. The trail is dog-friendly and is best used during March to October. If you are looking for a relatively short but worthwhile hike near Boulder, look no further than the Bear Canyon Loop Trail. This hike is approximately 3.5 miles with an estimated elevation gain of 400 feet, and the duration is roughly 2 hours, making this hike the perfect escape from the busy Boulder lifestyle. The trail is a loop, making this hike easily accessible for beginners who are new to navigating their way throughout the natural landscape. This dog-friendly hike is accessible year-round, with some winter closures, and is best used from March to November. If you are looking for a bit different scenery than the previous hikes mentioned, check out the Calypso Cascades trail in Rocky Mountain National Park. This 3.6 mile out-and-back hike gains roughly 700 feet in elevation, leading to several magnificent waterfalls. It really is one of the best day hikes near Denver. The trail is approximately 2 to 3 hours in duration, and about 1 hour and 30 minutes away from Denver. The Rocky Mountain National Park is a great option for a weekend getaway, with many options for natural beauty – make sure to check out Calypso Cascades for some unique sights. The Continental Divide is one of the most scenic aspects of Colorado, let alone the continental U.S. This area attracts many visitors, including backpackers, from all over the world. If you are considering a backpacking trip, but are still relatively inexperienced with Colorado hiking, consider the Continental Divide Loop Trail. This trail truly is one of the best hikes in Colorado, and simply a classic. It is a multi-day trip around the Continental Divide National Scenic Trial, packed with waterfalls, mountain meadows, elk viewing and glorious views. This 25-mile loop contains an elevation gain of 3,800 feet – but the trails are easily marked and accessible for beginner backpackers. Start from the trailhead at Tonahutu Creek for an unforgettable weekend with memorable views. If you are ready to up your hiking game, you need to visit Colorado for its range of moderate hikes. The hikes below will prepare you for more difficult day and multi-day treks, yet offer you stunning views that are enjoyable at every moment. This moderate hike is one of the best in Colorado, with its captivating views and historical significance. The Lost Man Loop is located near the continental divide at Independence Pass, famous throughout the world for its significance during the American expansion out west. It is no wonder this trail is called lost man loop – with the trail looping through forest, lakes, alpine meadows, it is easy for hikers to just want to “get lost” and remain in the Aspen wilderness forever. 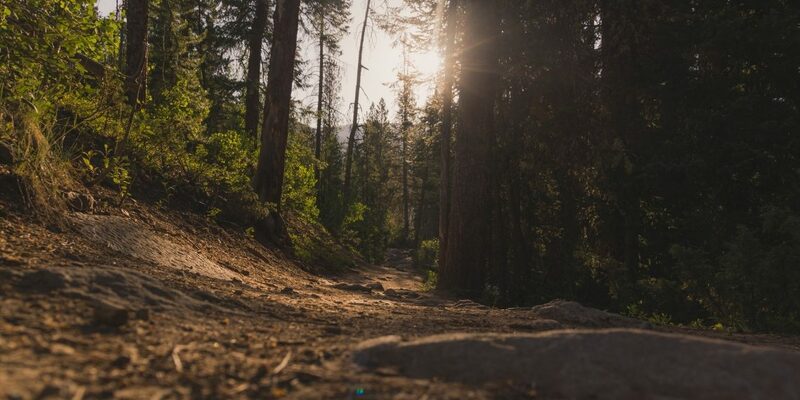 The trail is 8.8 miles, and is actually not a true “loop” – you must be prepared with shuttle transportation to get you back to the trailhead, which is 4 miles away from the end point on Highway 82. The extra effort is worth it. This 8.6 mile out-and-back hike is unforgettable for not only its scenic views, but also its fishing, hunting, and wildlife viewing. As this hike is located in a national forest, visitors are able to utilize the forest’s resources, within the limits of the applicable permitting and usage laws. This makes the 3-lake hike highly attractive to fisherman and hunters, especially in the summer and autumn. The hike is certainly not easy, however – the trail gains roughly 2,400 feet in elevation, and the weather may include dangerous thunderstorms mid-summer. Proper planning, however, will provide for a great experience. If you are looking for a moderate day-hike, which is relatively close to Denver, consider hiking Mount Audubon from the Mitchell Lake Trailhead. This hike is 7.9 miles with an elevation gain of 2,800 feet, but easily do-able in a day for mildly experienced hikers. Most of this hike is above the tree line, which provides stunning vistas. The best part? This hike is an underrated alternative to Rocky Mountain National Park, so it is a lot less crowded and offers an escape from the city and other humans. This hike is most accessible from late summer to early fall, as there may still be snow on the mountain as late as July. This 5-mile out and back hike is accessible year-round, and its difficulty ranges by season. Throughout the summer to the early fall, this hike is more moderate; but the Butler Gulch hike is also a relatively difficult snowshoeing hike as well. The trail gains 1,200 feet in elevation, so it is also popular for cross-country skiers in the winter. The trail is a 1 hour drive from Denver, yet offers you a semblance of isolation – this trail is low-key and low traffic. Throughout the Butler Gulch Hike, you will see views of peaks and wildflowers, as well as an old mine. This hike’s lack of popularity is irrelevant to the amount of beauty it holds for visitors. Finally, a moderate and short-distance day hike: Continental Falls near Breckenridge, Colorado. This hike is approximately 2.5 miles uphill for approximately 1,000 feet in elevation, and comes in at 5 miles round-trip. The trail is accessible year-round and is dog friendly. Breckenridge also offers world-famous ski slopes if you are visiting in the winter and open to explore other outdoor activities. When you arrive at the top of this peak, you will be greeted by a waterfall and views of spilling mountains, lakes, and more. Although Colorado offers a diverse landscape with a variety of hikes for various experience levels, some of the best hikers in the world visit Colorado for its hiking and backpacking offerings. If you are an experienced or aspiring “14er,” visit Colorado for its portfolio of peaks within this range. A “fourteener” is a person who hikes throughout a trail leading to a peak over 14,000 feet in elevation. Colorado is home to over 50 of such peaks. At 14,278 feet, Grays Peak is the tenth-highest summit in the Rocky Mountains, and the highest point in the Continental Divide. This 14er is beginner-friendly for advanced hikes. The trail is 8 miles round-trip and contains an elevation gain of 3,000 feet. The trail is also well-traveled, making it (relatively) easily accessible for beginners to the 14er club. Do not be fooled, with the technical aspects of this hike, you should be at least an intermediate hiker with capable physical abilities. Adjacent to Grays Peak is its 14er neighbor, Torreys Peak. This peak is accessible via three main trails. One trail is a continuation of the Grays Peak trail, mentioned above. This trail is extremely popular, despite its 14er status. If you opt out of the Grays Peak summit trail, you can access Torreys Peak from the Grays-Torreys saddle. This latter option is an 8-mile hike round-trip with a 3,000 feet elevation gain. If you are looking for another less “technical” 14er to climb, consider Longs Peak in the Rocky Mountain National Park wilderness. At 14,259 feet, Longs Peak is the highest point in Rocky Mountain National Park and in Boulder County. This hike is accessible to casual hikers in the summer and early fall months, despite its 14er status. However, it is not for beginners or even moderate hikers – at least, not if you plan to reach the summit. Longs Peak only has a 47% successful summit rate, but the hike will be beautiful regardless. It is best to research this peak more in-depth if you want to tackle Longs Peak from the Keyhole Route, which is the most popular route to the summit. The Keyhole hike is over 15-miles long with over 5,000 feet in elevation gain. Although technical gear is not required, it is important to be prepared as a backpacker, because there is a high level of risk due to the fall-potential. Also be on the lookout for storms and rock fall. The Keyhole hike to Longs Peak is not an ideal inaugural 14er – you would be much better suited if you attempted this hike after Grays Peak and Torreys Peak, mentioned above. If you prepare adequately, this hike can be an unforgettable experience. Pyramid Peak is located in the Elk Mountains, about 13 miles away from Aspen, Colorado. This peak barely surpasses the 14er threshold, coming in at 14,018 feet. Yet, this hike is one of the steepest routes to a 14er summit. The standard route is only 3 miles from the trailhead to the summit, yet covers over 4,430 feet of elevation gain. Be sure to research further if you are interested in tackling this peak. Colorado is well-known for its outdoor activities, and if you are visiting Colorado you should definitely look into a hike. With a variety of landscapes, elevation levels, locations, distances, and difficulties, there is certainly something for everyone in Colorado. From beginner day hikes, and backpacking trips, to introductions to the 14er club and some of the most steep summits in North America, it is no wonder that the wonders of Colorado attract people from around the world.